Nowadays, 3D display has been widely used in consumer electronics especially for enhancing multimedia experience. The notable feature of the 3D display is it able to convey three-dimensional images to the viewer. As part of promoting 3D display, Acer has officially launched its first Aspire One notebook with 3D display which called as 5738DG. 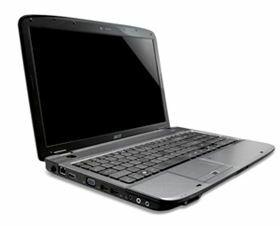 The device offers similar specification of its 5738 notebook which replaces the multi-touch display with TriDef 3D screen. It has been improved with GeForce 3D Vision technology that splitting a 120Hz signals into two 60Hz stereoscopic images. Featured with a 15.6-inch TriDef 3D display with 1366×768 resolutions, the 5738DG notebook is also preloaded with 64-bit Windows 7 Home Premium. It is being powered by Intel Core 2 Duo T6600 CPU with 4GB of system memory and integrated with Radeon HD 4570 Graphics card with 512MB of dedicated memory and 2304MB of Hyper memory. In addition, it comes with a 320GB hard drive, a DVD player and supports 802.11b/g/n connectivity. The Acer 5738DG notebook is expected to be available soon and is priced at $780.